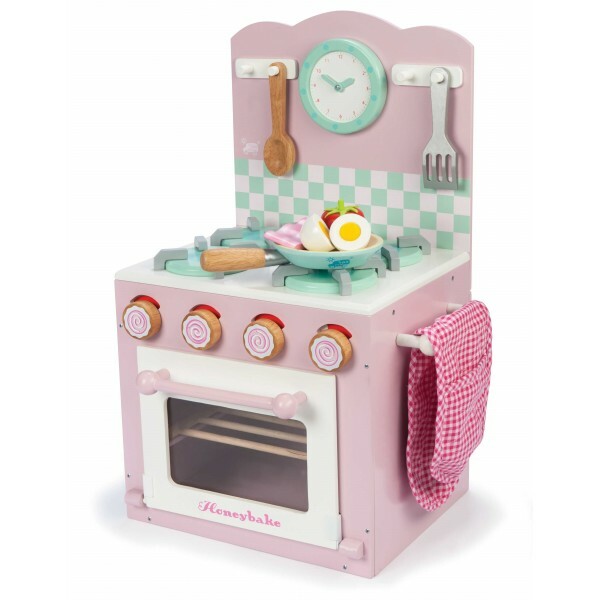 Cook up a feast with this stunning Honeybake Oven and Hob from our friends at Le Toy Van. Crafted with beautiful detail and enormous play value, this wonderfully well made cooker comes with its own saucepan, frying pan, utensils, and oven glove - there's even some wooden bacon, a tomato and an opening boiled egg! In a striking and very feminine pink, future Head Chefs will have endless fun cooking on one of the world's finest role play cookers, from a company whose products have become a watchword for design and quality. A beautiful cooker with lots of additional touches and extra pieces to make the cooking easy from the word go. Forms part of the extensive Honeybake range of playsets from Le Toy Van, so it's simple to extend the fun. A very sweet pale pink colour makes this a very feminine toy that looks amazing in any little girl's bedroom.